President Donald Trump and Japanese Prime Minister Shinzo Abe smile during their meeting at Trump's private Mar-a-Lago resort, April 17, 2018, in Palm Beach, Fla.
U.S. President Donald Trump on Tuesday endorsed Seoul's efforts to try to negotiate with Pyongyang to end the Korean War. "They do have my blessing to end the war," Trump told reporters as he sat next to Japanese Prime Minister Shinzo Abe at the start of their meeting. "People don't realize the Korean War has not ended. It's going on right now. And they are discussing an end to the war." Active combat in the war ended in 1953 with an armistice signed by the United States (which commanded U.N. forces), North Korea and China. South Korea was not a signatory, and the two Koreas have never established diplomatic relations. Abe praised Trump for agreeing to hold a summit with North Korean leader Kim Jong Un, saying the move took "courage." Trump said the summit "will be taking place probably in early June or a little before that, assuming things go well. It's possible things won't go well, and we won't have the meetings, and we'll just continue to go along this very strong path that we've taken." Shortly afterward, in an extended bilateral meeting, Trump revealed that in preparation for the summit, "we have also started talking directly to North Korea. We have had direct talks at extremely high levels." 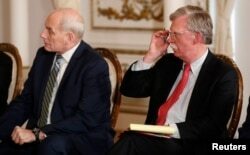 White House Chief of Staff John Kelly and national security adviser John Bolton attend U.S. President Donald Trump's meeting with Japan’s Prime Minister Shinzo Abe at Trump’s Mar-a-Lago estate in Palm Beach, Fla., April 17, 2018. The president said of the North Koreans that "they do respect us, we are respectful of them." Abe expressed relief that Trump pledged to address with Kim issues of concern to Tokyo, including abductions of Japanese citizens over the decades. He praised the U.S. president for maintaining a tough stance toward Pyongyang's nuclear weapons and ballistic missile programs. "Donald, you demonstrated your unwavering determination in addressing the challenge of North Korea," the Japanese prime minister told Trump. According to Larry Kudlow, assistant to the U.S. president for economic policy, "a lot of key issues are on the line" during the two days of talks between Trump and Abe. The discussions Tuesday at Trump's Mar-a-Lago resort off Florida's Atlantic coast are focusing on North Korea and then will turn to trade issues Wednesday, according to White House officials. "We're certainly going to be taking into account the full range of threats North Korea poses to regional security," said Matt Pottinger, senior director for Asian affairs on the National Security Council. Japanese officials also want to avoid having Trump try to link any trade negotiations to security matters, a separation strictly maintained during decades of post-World War II diplomacy between the former enemies. But Trump has frequently stated that military allies, such as Japan and South Korea, should pay more for American forces defending them. FILE - U.S. Air Force C-130 Hercules transport planes park on the tarmac of Yokota Air Base in Tokyo during a U.S.-Japan joint military exercise, Dec. 6, 2010. "I don't think Prime Minister Abe will leave Mar-a-Lago with anything other than a high degree of confidence in the alliance," predicted Pottinger. There is disappointment in Japan that despite the close relationship between Trump and Abe, the U.S. government has not exempted Tokyo from tariffs placed on steel and aluminum imports. "It will be under discussion," Kudlow told reporters. "It's a key point on the agenda." On a related topic,"the United States would probably like to see a free-trade agreement [with Japan] come out at some point," Kudlow told reporters early Tuesday afternoon, hours before Trump and Abe met. The economic adviser also said that "there's nothing at all concrete" yet on a possible U.S. return to what was the 12-nation Trans-Pacific Partnership. "It will come up in the summit, no question about it," Kudlow said in reference to the TPP, from which Trump withdrew shortly after becoming president. Kudlow, a conservative economic commentator who recently joined the Trump administration, also denied any linkage between TPP and China trade issues. But he said a global trade coalition of the willing needed to be formed as a bulwark against Beijing. China, added Kudlow, "really needs to play by the rules, or there will be consequences." One unscheduled item appeared to have been added to the Trump-Abe agenda: "We're going to sneak out tomorrow and play a round of golf if possible," Trump told reporters Tuesday afternoon.